Local Artist, Debbie Daniels, recently took a large commercial space that became available in downtown Friday Harbor, and created a vibrant new space to serve the artistic interests of the community of Friday Harbor. 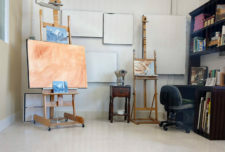 The facility, including the private artists and their studios, will be open on the 1st Friday of each month, from 5-9 pm, starting December 14th. Friday Harbor Atelier, is an independent group of artists working in a common studio space at the corner of Spring Street and Argyle Avenue. The “Atelier,” or artist workspace and studio, is approximately 3,000 square feet of art studio space featuring central heating and air, art supply storage, community workspace available to rent for classes and events, private studio spaces, and restrooms, with natural daylight and full spectrum lighting. The common area has also had successful classes, with local artist, Marsha McAllister, with more to be offered soon. It is the hope of the Atelier artists that more artists will become involved, and participate in the Open Studio nights with displays in the common workspace. There is currently a large communal area available for special workshops and classes, renting for $40 per hour ($30 per hour for members)and/or $250 per day ($200 per day for members). There are currently five private working artist studios, already filled, with a wait list for three additional studio spaces to be created by March 2019. “We are absolutely thrilled about the positive response from the community, especially learning the need for professional artist studio space. We have already had classes held in the common area, and all private studios are filled. I am amazed by the inspiration from the artist collaboration that has already occurred, and look forward to watching us all grow together as a strong artist community,” states Daniels. Daniels, is a long time Friday Harbor resident, and her mesmerizing artwork is represented by Waterworks Gallery, next door to the Atelier. The current Atelier studio artists, are Winnie Brumsickle, Dee English, Bill Carli, Pamela Hoke, Shannon Borg and Debbie Daniels. Their studios are primarily closed for focused work and for private client appointments, yet tours can be arranged. Classes and workshops will be announced online as they are scheduled. For more information, please contact fridayharboratelier@gmail.com, or call (360) 298-6745.